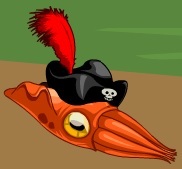 **Click your Cephalopod's hat to have it focus on blinding your foe! **Your Cephalopod will now attempt to blind foes! *†Click your Cephalopod's hat to have it focus on damage! ††Your Cephalopod will now focus on damage! *‡The ink gets in your foe's eyes, blinding them! ‡‡Your foe is soaked by the ink, but avoids getting any in their eyes. This cute & cuddly cuttlefish will either strike with its tentacles or fire a shot of blinding ink at your foe! Numbers thanks to In Media Res. Image and description thanks to Carandor. ATTACK #1: Deals +5% damage as a mastercraft bonus. With two equally powerful hits, each hit does *1/2 damage. ATTACK #2: Deals *0.5 damage to pay for the effect. 14 September, 2017: The pet was released.